Stocks closed higher on Thursday, adding to the massive gains from the previous session, after a strong surge in the final hours of trading. The Dow Jones Industrial Average ended the day up 260.37 points, or 1.1 percent, at 23,138.82. The S&P 500 closed 0.86 percent higher at 2,488.83 while the Nasdaq Composite climbed 0.4 percent to 6,579.49. At its lows of the day, the Dow had fallen 611 points. The S&P 500 and Nasdaq fell as much as 2.8 percent and 3.3 percent, respectively. The major averages started surging after 2 p.m. ET, around the time they all hit their lows of the day. Art Cashin, director of floor operations at UBS, said market-on-close orders went from $200 million to sell to more than $2 billion to buy late in the day. "That started the early rally," he said. "They thought they were going to be huge sellers, now they're huge buyers." Earlier in the day, stocks fell amid renewed tensions between China and the United States. Reuters reported, citing three sources familiar with the situation, that President Donald Trump is considering an executive order to ban U.S. companies from using equipment built by Chinese firms Huawei and ZTE. This executive order would come at a time when the two largest world economies are trying to strike a permanent trade deal. Earlier this month, China and the U.S. agreed to a 90-day grace period to come up with an agreement. "The uncertainty will continue to weigh on the market," said Dave Campbell, principal at BOS. "I think that's going to help drive the volatility as we roll forward because I don't think it's going to be a clean path to an agreement or some kind of resolution." "China has recognized they're a little more vulnerable in this trade negotiation with the U.S. because they have more at stake than the U.S. does, from a bilateral stance," Campbell said. "I think there will be a resolution, but it's going to be a rocky path, which to me means a lot more volatility both up and down." Thursday's moves comes after a historic surge on Wall Street. On Wednesday, the Dow rallied to close more than 1,000 points higher, its biggest single-day point gain ever. 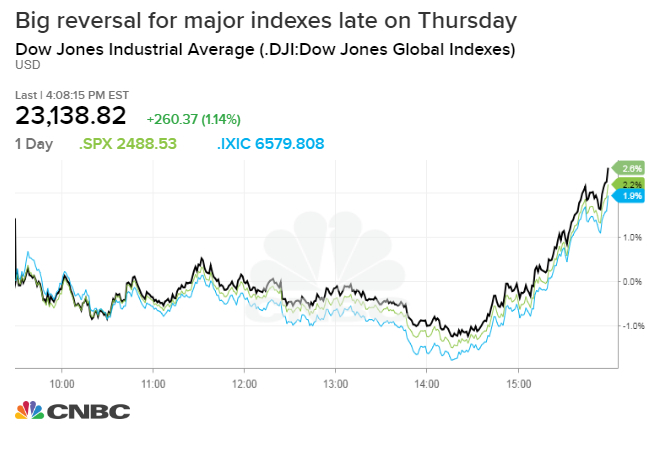 "Just when everyone had counted the market down, the market bounded back," John Carey, a portfolio manager at Amundi Pioneer, told CNBC on Thursday. He described the Wednesday bounce on Wall Street as "very positive" and also "quite surprising." "I think it has to do with valuations, we got to a point where the market had sold off about 20 percent and price-to-earnings multiples had come down on the S&P from the low 20s to 15-16 times earnings and all of a sudden people looked around and thought stocks might be a good buy," Carey said. Wednesday's gain also marked the biggest upside move on a percentage basis for the Dow since March 23, 2009, when it rose 5.8 percentage points. The S&P 500 and Nasdaq also notch their best gains since March 23, 2009. However, investors remained hesitant to call Wednesday's lows a bottom. Benjamin Lau, chief investment officer of Apriem Advisors, said this market is "completely emotionally driven," adding: "When the trend gets like this, it's hard to say when it will end."